Fisher, whose family has owned Kindel since 1964, recognized that there was an opportunity for Pinehurst to team with a traditional yet innovative brand like Kindel. 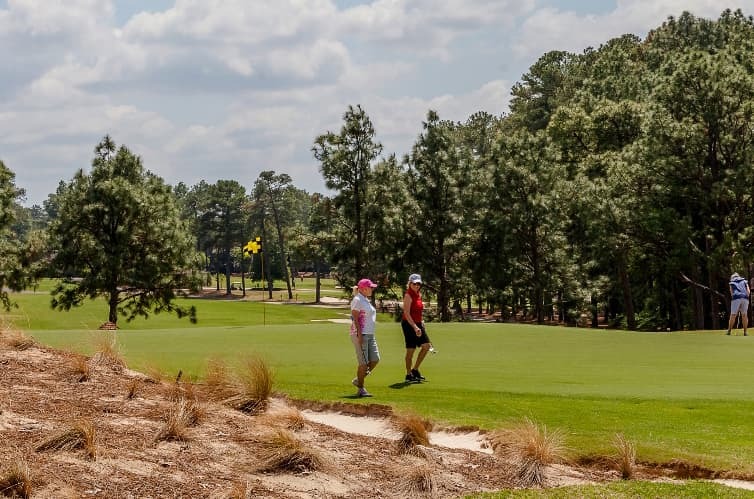 “We clearly saw the significance of tying the history of the Resort together with Kindel because we share common goals about the value of our heritage and carrying forward principles of our craft,” says Pinehurst President Tom Pashley. The Pinehurst Kettle Stands are available online and on site at Pinehurst. You can learn more here. The essence of this collection emanates from the design of the product complemented with the wood species that were selected in crafting the furniture; premier Knotty Pine veneers and Maple. The Pine is perfectly suited to reflect the landscape of the resort in Pinehurst. Because of the expertise and versatility of the Kindel Grand Rapids finishing process, the designs are complete with finishes that create a lifestyle collection that reflects how we live today. The Pinehurst Cocktail Table, which features a 1922 map of the Donald Ross-designed courses at Pinehurst, is available online and on site in Pinehurst’s retail shops. You can buy it here. Each piece of furniture is embellished with a bronze medallion of the Putter Boy, the iconic logo of the Pinehurst Resort. The classic design of the furniture combined with the Knotty Pine in various colors allows Kindel to honor their rich heritage while simultaneously appealing to a broader audience. Kindel has continued to evolve in recent years to offer a wide spectrum of designs and finishes to emerge as the preeminent source for high-end, luxury furniture.